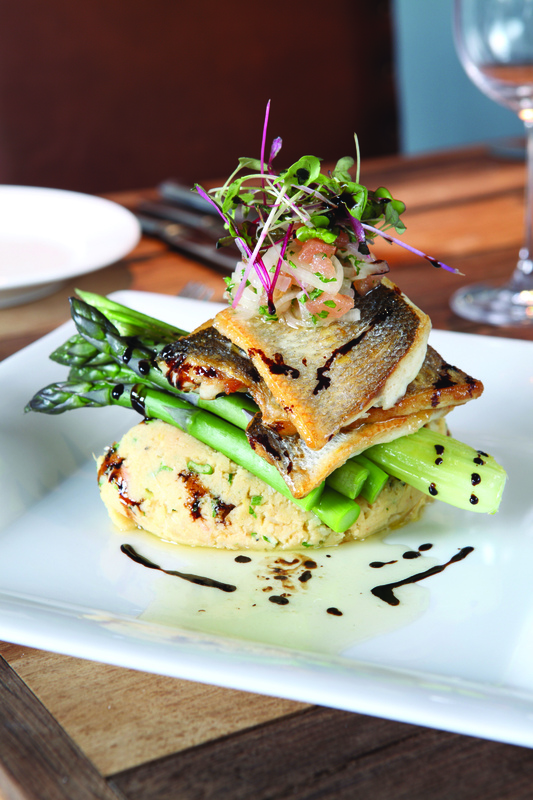 Fillet of Sea Bass on Crab Mash with Shallot Dressing. For the mash, cook the potatoes and pass through a potato ricer. Mix the remaining mash ingredients in a bowl and fold into the hot mash. For the dressing, peel and cut the shallots in half and slice finely. Drop the tomatoes into boiling water for 15 seconds to slip off the skins. Cool in cold water, finely dice the tomatoes and mix with the other dressing ingredients. For the garnish, cook the fennel and asparagus in boiling, salted water for three minutes until tender. For the bass, panfry in oil and butter skin side down, until the skin crisps. Turn over at this point, pull off of the heat and allow to sit off the heat for two minutes until cooked through.